The Premier League 2016 begins on February 4 in Leeds. Michael van Gerwen finishes top of the league for the fourth year in a row and on the final day he leaves no doubt to who is currently the best player in the world, he takes the title convincingly for the second time in his career. This year the top four in the world are Michael van Gerwen, Gary Anderson, Adrian Lewis and Phil Taylor. The four PDC wildcards go to Peter Wright, James Wade, Michael Smith and Robert Thornton. The last two places are on behalf of SKY Sports given to Raymond van Barneveld and Dave Chisnall. In the regular season, rookie Michael Smith struggles from week one. Because Gary Anderson cannot play in week one he has to play twice on the first day and he loses both matches. He never really recovers from those two defeats and Bully Boy finishes last in the league after nine weeks. More surprising is that Dave Chisnall doe not survive Judgement Night. A final sprint by Robert Thornton sees him overtake Chizzy who drops out after nine weeks. Michael van Gerwen and Phil Taylor fight to the last round of play to finish top of the table. It’s Van Gerwen who comes out the winner in a packed Ahoy Rotterdam. It is the first time in the history of the Premier League that the league leaves the UK and tickets for this event are sold out in 47 minutes. The players are welcomed to an orange sea of supporters. It is also the first year that a price is paid for the player who finishes top of the Premier League after 16 weeks, 25,000 British pounds is the reward. Besides Van Gerwen and Taylor, Gary Anderson and Adrian Lewis qualify for the playoffs in London. Peter Wright just misses the boat. It will be a historic Premier League season as Michael van Gerwen beats the record TV average set by Phil Taylor, which stood at 118.66 and dates from 2010. In Aberdeen Mighty Mike beats Michael Smith an records an average of 123.40. Adrian Lewis also wrote a piece of history as he hits a nine-darter in Belfast in week 11 against James Wade. 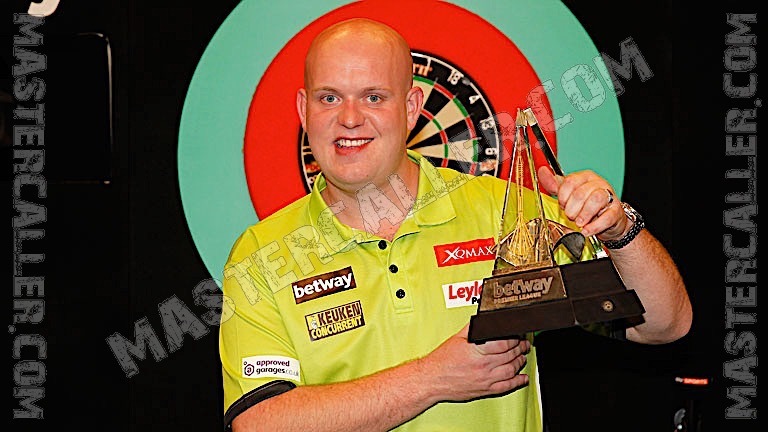 The previous nine-darter in the Premier League already dated back to 2012. In the playoffs Van Gerwen wins by a wide margin (10-4) against Adrian Lewis and Phil Taylor beats the defending champion Gary Anderson 10-7. The final actually remains exciting for only six legs. With Van Gerwen 3-2 ahead Taylor misses a full turn on the double and never will recover. The six-time Premier League champions will only win one more leg as Van Gerwen takes the title with an 11-3 win.